What are the different types of hackathon? What is an online/virtual hackathon? What is an offline hackathon? What are the benefits of conducting a hackathon? How does HackerEarth's Innovation Management software help? How can you conduct an internal hackathon? How do you market a hackathon? What are the dos and don’ts of hackathons? Who owns the hackathon intellectual property rights? What are Machine Learning hackathons? What is the role of hackathon in the process of innovation? Why should companies conduct hackathons? What is the best time to organize a hackathon? A hackathon is a competitive event in which a team of designers, developers, and subject matter experts collaborate to create solutions for a specific problem within a defined time frame. The goal is to build a working prototype, in the form of a website, an app, or a robot, to solve a given problem. Also known as a “Hackfest” or a “Hack day,” the event gives participants the opportunity to network, collaborate, and productize their ideas. The most popular form of a hackathon is a physical or an offline one. It usually lasts for 24 hours and is generally scheduled on the weekends. Participants are encouraged to come up with creative solutions to solve problem statements for specific themes mentioned in the hackathon. For participants, a hackathon is the perfect platform to explore new technologies, work on a project they are passionate about, and build a working proof-of-concept in a short span of time. It’s also an opportunity for them to network and collaborate with like-minded people who are passionate about building products. Hackathons are no longer restricted to just the developer community. Anyone who can contribute to building a product can participate in a hackathon. Organizations conduct hackathons to encourage creative problem solving, drive innovation, and build brand awareness. Many companies conduct internal hackathons within their organizations to engage their employees and promote a collaborative work environment. Additionally, external hackathons help firms in finding and recruiting talented professionals at a lesser cost than traditional recruiting methods. Instead of going through tedious rounds of interviews, companies can assess potential candidates based on their performance in a hackathon. Depending on their objective, companies may opt for either an internal hackathon or an external hackathon. In today’s digital era, the success of a business depends on its ability to sustain innovation. To meet growing customer expectations and beat the competition, companies must innovate fast and build new features to improve their product or service. The biggest advantage a hackathon offers is a structure to scale innovation and build new features. Concrete ideas derived from hackathons can help companies provide better customer experience and improve revenue. Traditionally, the responsibility of coming up with innovative products, services, and business models was assigned only to a handful of people within the organization. Generally, a dedicated R&D or Innovation Department is assigned the task. Nowadays, companies, both big and small, conduct hackathons to drive innovation. Companies are scaling innovation by reaching out to everyone within or outside the organization as opposed to depending on just a handful of people. With platforms like HackerEarth Sprint, companies can now easily crowd source solutions, from both internal and external audiences, with minimal investment of time, effort, and capital. With this approach, the team primarily responsible for innovation works with the entire hackathon crowd to synthesize ideas, build proof of concepts (PoCs), and then undertake the shortlisted ideas for development. By providing a structure to develop ideas, a hackathon essentially makes it easier for firms to implement innovation. “If you look at history, innovation does not come just from giving people incentives; it comes from creating environments where their ideas can connect,” says Steven Johnson, an American author. In a way, hackathons complement traditional innovation methods. Through hackathons, companies harvest ideas and knowledge to take their technology to the next level. With the added advantage of crowd-driven ideation, companies can now move fast, reduce the time-to-market, and stay ahead of competition. A portmanteau of the words “Hack” and “Marathon,” the term 'Hackathon' refers to an event in which participants compete to build working prototypes to solve specific problems. As a competitive challenge dedicated to creative problem solving, hackathons have gained the interest of organizations worldwide. Based on their objective, organizations may either choose to conduct the hackathon internally (internal hackathon) or keep it open to the public (external hackathon). Apart from internal and external, hackathons can also be offline or online. Additionally, hackathons can be demography-based or targeted at specific groups of developers, with knowledge of certain programming languages or specified level of coding expertise. Depending on whether the event is participant-focused or output-focused, different types of hackathons are conducted for solving problems, altruism, branding, recruitment, product feedback, engagement, and so on. An internal hackathon or a corporate hackathon is conducted by an organization for its employees, with the aim of crowd sourcing ideas, promoting intrapreneurship, or boosting collaboration and employee engagement. At HackerEarth, 500+ companies, including GE healthcare, Kone, GSK, and Dreamworks, have used this approach to generate innovative ideas to scale their business. With internal hackathons, companies can involve employees from non-technical backgrounds in the project and promote a culture of collaboration. Internal or private hackathons give employees the freedom to think outside of the box and pitch their ideas to the senior management. In external hackathons, a company engages people within and outside the organization. Participants are often influenced by themes and goals that are set. This form of hackathon enables companies to harvest ideas from across the globe. Online or virtual hackathons work well when companies want to engage participants simultaneously across different geographies and time zones to solve a problem or drive innovation. As the name suggests, everything from registration to idea submission to judging happens online. Offline hackathons are great for driving external developer engagement, recruitment, beta testing of existing products, and innovation of new apps. An offline hackathon is conducted at a physical location. These hackathons are based on specific platforms for development like mobile device operating systems, desktop operating systems, video game development, etc. The last decade witnessed the emergence of social hackathons. These hackathons address prominent issues, including healthcare, education, and public services. Aimed at empowering people, these events provide a platform to brainstorm, develop ideas, and build technological solutions to address specific problems in the community. Companies often conduct hackathons to engage specific demographic groups like students or women. These hackathons are often conducted alongside interactive workshops to engage a specific community of developers. Such events are aimed at building brand awareness and promoting a collaborative culture that nurtures innovation. A code sprint is a programming competition that involves the writing of code to create working software within a specific time frame. These events generally last longer than hackathons, that is, for about one to three weeks. Industry-specific hackathons are conducted to drive innovation in specific industries that already have established products and technology. The popular niche-based hackathon, Music Hack Day, is an example of an industry-specific hackathon. Based on their objectives and target audience, organizations may opt to conduct different types of hackathons. Through hackathons, companies can engage the developer community, drive innovation, build new products, and upgrade existing products. To learn more about trends and insights on hackathons, download the Global Hackathon Report. Traditionally, the only way to be part of a hackathon was to be physically present at the venue. This meant that you’d miss all the fun and action if you couldn’t make it to where the hackathon was being held. Thanks to the internet, things have changed. The emergence of the digital era and crowdsourcing platforms have made the concept of online hackathons possible. Hackathons can now be conducted online or offline, or as a hybrid of both formats. You can participate in an online hackathon from anywhere in the world. In an online or virtual hackathon, all participants are remotely connected. Irrespective of their location, hackathon enthusiasts can participate and demonstrate their skills on an online hackathon platform using various tools. An online hackathon thus gives everyone the opportunity to participate, showcase their skills, and have fun. Online hackathons are often used for narrowly-defined coding challenges which test participants’ experiences and expertise. These events can be based on specific APIs, frameworks, or programming languages. Companies use online hackathons to engage their employees simultaneously across different geographies and time zones to solve a problem or drive innovation. Additionally, online hackathons have a greater reach. With an online hackathon, companies can reach out to millions of developers across the globe. The process of collecting submissions and evaluations is automated in the case of online hackathons, making it easy for organizers to shortlist the best ideas at a much faster pace. To conduct an online hackathon successfully, you need an online platform to manage the event. A strong online platform like HackerEarth Sprint is used to connect with the right audience, set reasonable hackathon goals, gather and record the ideas and prototypes generated, and facilitate judging of those ideas or prototypes. This means that everything from registrations to submissions to evaluations will happen virtually, or online. Without an effective platform for conducting the hackathon, it becomes difficult to organize the registration and submission data. This directly impacts the quality of the hackathon and scale of innovation. This in-house mail engine has helped HackerEarth save more than US $3,500 per annum. This is an internal grammar and guideline checking tool. When managed correctly, online hackathons offer companies a cost-effective and faster way to innovate, develop ideas, and build new products. An offline hackathon is one of the most traditional, tried, and true form of programming challenges. At an offline hackathon, participants work collaboratively to innovate at a physical location. In this format, organizers will need to consider time, geographical, and logistical constraints while designing the hackathon. In an offline hackathon, organizing workshops, hosting knowledge-sharing sessions, and getting the venue, tools, and other aspects of the working environment ready are important. For hackathons that focus on the output, the objective could be IP development, branding, or innovation. *Hackathon platforms can be used as an innovation management software and act as platforms to ideate and interact for developing interesting products and processes. HackerEarth’s innovation management software helps companies innovate through a data-driven and people-centric process. It is a platform to ideate and collaborate on interesting products, solutions, and processes. It also helps companies to crowdsource solutions from internal and external audiences, helping them minimize the time, effort, and capital spent on driving innovation. Organizations use Sprint to crowdsource ideas that help them meet larger goals, which are broken down into distinct themes and specific campaigns. Our innovation management platform gives everyone the power to share their ideas and ensures that their voice is heard. It allows everyone within an organization to submit ideas on a variety of topics like products they work on, company processes and overall goals, etc, regardless of their physical location. It also has in-built, cross-functional features for diverse teams to work collaboratively by easily sharing feedback and picking the best and most feasible ideas. This helps companies execute new ideas at a phenomenal pace, helping them stay ahead of the competition through constant innovation. HackerEarth also hosts a global network of top developers that companies can tap into through Sprint to generate ideas and solutions. Whether it is for crowdsourcing interesting ideas or generating prototypes and MVPs for new features and products, the community assists firms in driving growth externally and increasing their revenues incrementally. GE, IBM, Wipro, Walmart Labs, and Bosch are some of the 500+ companies using Sprint. Learn more about HackerEarth's Innovation Management Platform. Hundreds of large and small businesses use internal hackathons to kick start creativity in their organizations. Companies such as Google, Whirlpool, and Facebook have been doing it for years and hold internal hackathons to encourage new product innovation by their employees. For example, the like button, chat button, and timeline of Facebook were created during its company internal hackathons. Companies need to find themes that are fun for employees yet in line with business goals. Define the problem statement: What is the exact problem you are trying to solve or what are the opportunities that you want to explore via innovation? Engage people from across: Ensure your teams have people from all levels with different skills to avoid groupthink and encourage networking and teamwork; diverse ideas spell quality. Make time for good breaks in between: Some engaging games or free food keep the hackers motivated to work better, ensuring that good results are achieved. Robert J. Moore from RJmetrics says that if the times of these breaks be defined, hackers take them as milestones and are inspired to hack through each of them. Have a deployment process in place: An important metric to measure the success of a hackathon is that it gets deployed in working projects. It is a motivation factor for teams that their projects will be implemented and will be accessible to people. Judge ideas based on novelty, feasibility, simplicity, design, and business value. Wrap-up: After the hackathon is over, showcase the results to the world. Share pictures and videos on your website, do a blog post with the winners, and get the story out in the media. Partner with organizers (e.g. HackerEarth, MLH, BeMyApp) that have access to a large ecosystem of developers, along with experts, evangelists, and entrepreneurs; they have experience in designing, hosting, and promoting hackathons tailored to specific needs. Do not let your hackathon happen in a vacuum. Share the learnings with the organization. Blogs, mailing lists, or lunch-and-learns are all great ways to spread the news. Showcase the outputs and cool apps that were built. Remember that hackathons are part of a longer-term strategy to engage developers, build your employer brand, and foster a culture of innovation within your company. Targeted promotion through well-crafted press releases and social media (Twitter, Facebook, LinkedIn, Instagram, etc.) posts and ads go a long way in promoting the event and garnering interest. Make sure that potential sponsors from different kind of domains can be part of this event. The tiered sponsorship and relevant pricing should be used for what you can provide in return for support. This can include different kinds of product or API exposure as well as branding opportunities. The expensive components of a hackathon are venue, food, and prize money – assistance from a title sponsor should take care of at least one of these, and this will make sense in the branding of your hackathon. Timeframe Do limit the event to 24–48 hours to encourage focus and minimize distractions. Do not run a longer event which makes it harder for attendees to maintain concentration. Theme Do make it practical and related to solving real-world challenges. Do not make it too specific or too abstract. Skill Sets Do make it clear if participants need to know certain skills or languages. Do not assume that attendees will have the appropriate skills or experience. Outcomes Do expect functional prototypes. Do not expect polished products. Promotion Take the marketing of the event seriously - partner with a hackathon planning company. Do not assume large numbers of developers will show up magically. Demos Do keep it short and sweet (5–15 minutes maximum). Do not drone about your products for 45 minutes. Internet Do make sure the internet and Wifi in the venue can handle heavy hackathon activity. Do not order minimum bandwidths and hope for the best. Equipment Do provide enough flip charts, whiteboards, and electrical outlets for all participants. Do not assume attendees will bring their own supplies and extension cords. Mentoring Do have experts available during the event for questions and provide starter kits and skeleton code. Do not expect developers to become experts in your technology within 24 hours. Food & Beverage Do have a variety of nourishing options available throughout the event. Do not provide just pizza, energy drinks, and water. In case of an internal hackathon, all rights are owned by the organization conducting the hackathon. The company has the full ownership of inventions made by its employees. Companies need to ensure that employee agreements have provision for hackathon participation; when employees go for external hackathons, make sure those are not related to the employer’s business interests to avoid conflict. Companies should provide Intellectual Property (IP) counsel about IP risks and opportunities before the hackathon. In case of open or public hackathons, the ownership rights are often open to dispute. In this case, the inventions are made by an unpaid third party — the hackathon participants. A professional hackathon platform or agency will help you create a foolproof hackathon policy that addresses all the details of IP rights. Whether it is an internal hackathon or an open hackathon, it is crucial to have a good IP strategy in place before conducting the hackathon. Be clear on the rules for use of tools and content that is made available to participants. Communicate these policies related to invention ownership clearly to the participants. As a participant, read the hackathon agreements and rules carefully before attending the event. Most of the time, the IP will belong to you. However, in case you work on a company’s API, the idea will belong to it. Be sure to double check with the organizer and read the participation agreement to check for any indemnification clause. If you are employed elsewhere, review the hackathon terms to see if your participation causes any conflict of business interest with your current employer. Machine Learning Hackathons are broadly of two types ¬¬ − a hackathon where you submit an ML-based application or a hackathon where you submit an ML/statistical model that solves the problem at hand. Even though there are two kinds and the former seems closer to the typical format of a hackathon, the latter format is preferred by companies and ML enthusiasts. This is because statisticians and ML enthusiasts, in general, prefer to improve their core competencies instead. So, for an ML hackathon, they will need to get an app builder in their team. Future Group- a leading retailer crowdsourced digital solutions to master customer data management. Societe Generalel- The French multinational bank built predictive models from its banking and financial data. You can also check out Natural Language Processing hackathon & Unilever's ML hackathon. Companies use hackathons as tools for sustained innovation. Even smaller companies with a shoestring budget for innovation find hackathons promising. With hackathons, you can take the market insights you have identified, translate it into themes and problem statements, and open it up for ideation followed by the development of prototypes. (Check out a successful example from KONE elevators here.) Hackathons are a great way to collaborate with external partners, spawning meaningful innovations from a diverse set of inputs. What makes a hackathon unique is that it is the only tool that enables the creation of minimum viable products or prototypes from ideas. There is no other innovation activity that covers roughly 70% of the process; it causes very little disruption to everyday operations. 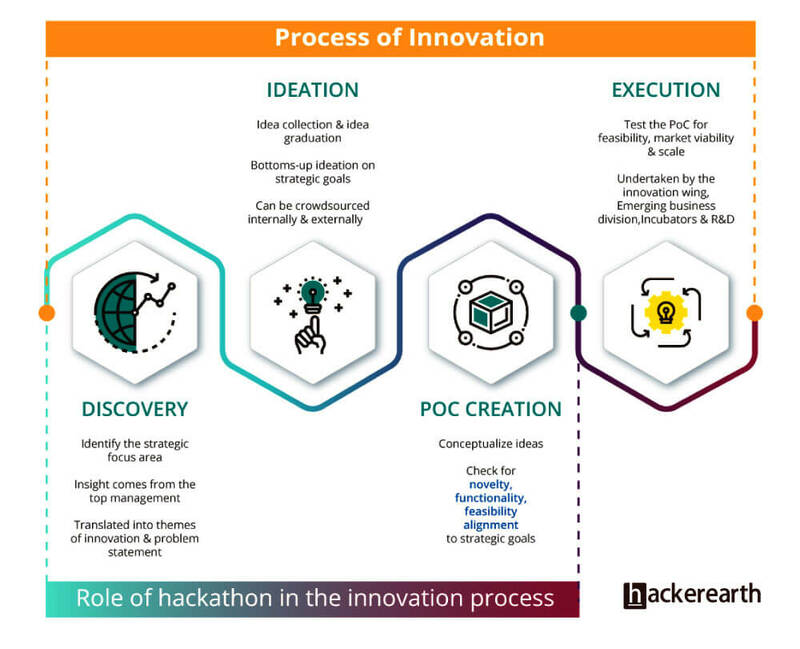 Here is an infographic that illustrates the role of hackathon in the process of innovation. Engaged employees are empowered innovators. Internal hackathons are great tools for employee engagement. Engaged employees pursue ways to innovate, which can translate to improved quality, enhanced customer experience, brand building, increased profitability, or just more creativity. They go the extra mile, align their career goals with the organization’s goals, steer better business outcomes, and boost workplace happiness and creativity. Hackathons can immensely help in fostering innovation, employee engagement, or product marketing. Within a short span, the working prototype, which would go through the typical innovation management cycle, is vetted, scrutinized, examined for market viability, and then developed into a product or service, ready to be taken to the market. Hackathons also help companies get feedback about a product or some part of the business. This helps them to stay ahead of the curve as the product continually evolves to be the best in the market. Beyond innovation, companies also use hackathons for API adoption. Hackathons are also used to create brand advocates from a developer community. Once you successfully host or sponsor a hackathon, you build a community of developers who are a simple marketing channel that is cost effective; these developers, designers, or thinkers helps in ideation for future strategies, review of beta products, creation of revenue, or brand awareness. An employer branding hackathon is a highly targeted branding activity. It allows a company to let potential employees know what the company stands for, the challenging projects it works on, and communicates its values to them. The dataset of the companies are put to better use. The data is used for driving innovation internally, which is vital for sustained innovation in a company. Companies are innovating with hackathons by reaching out to everyone within or outside the organization as opposed to just a handful of people or teams. To know more, read 6 reasons why companies conduct hackathon. This will depend on where you are located. However, regardless of your city, hackathons are typically fewer during summer months. November to March is usually defined as low season. Shoulder season is April to mid-June and September to October. High season is mid-June to August. If you are in the US or Europe, September to November and then January to April are the ideal months for conducting successful hackathons. Day wise, Saturday to Sunday is the best combination of days. If your event will have a lot of workshops and keynotes, you might consider starting on a Friday after lunch.